When researching your genealogy one of the things that you have to pay close attention to is the timeline of county formation in a state. Especially if your ancestors or family were early settlers in a state or an area of a state. 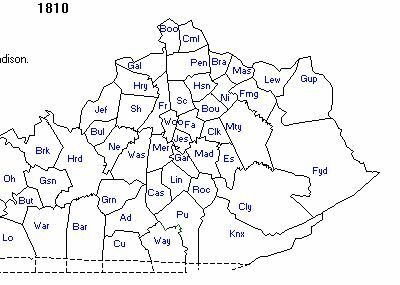 Here is a county map of Kentucky for 1799 the year that Adam was born. This and the following county maps are from mapofus.org which is a great resource for genealogy. In this map we see Bourbon County as Bou. 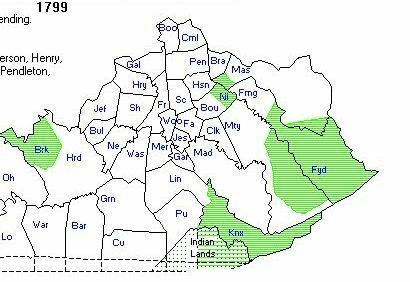 Part of the county is shaded green. 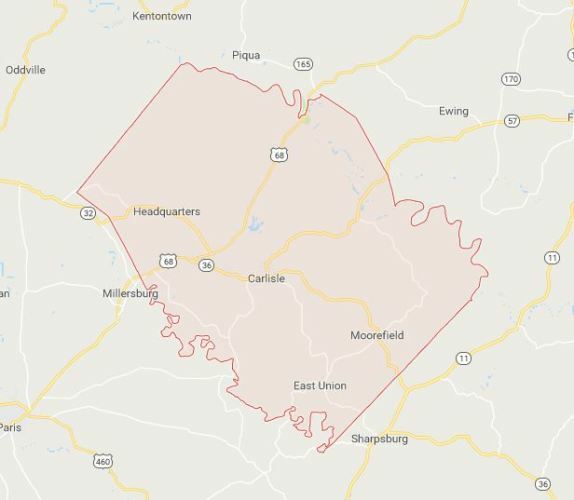 The green area is the pending formation of Nicholas County. So now the question is whether the Sears family lived in the section of Bourbon County that became Nicholas County. As you can see from the timeline above the 1800 and 1810 Census both show that the Sears were still living in Bourbon County. Here is the 1810 county map and you now see that Nicholas and Bourbon have been divided. In 1817 Nicholas County gained some territory from Bourbon County. However, the border did not shift enough to include where the Sears lived in Stoner, Kentucky. However, it may have shifted enough for the Kern family to be in Nicholas instead of Bourbon. I still have not figured out exactly where they lived. I do know that they were involved with the Old Concord church which is in the southern part of Nicholas County. East Union was the home church of Peter Hon who performed the marriage ceremony of Adam Sears and Susannah Kern in 1819, and it was not far from the Concord church. It is possible that East Union may have been in Bourbon County before 1817. 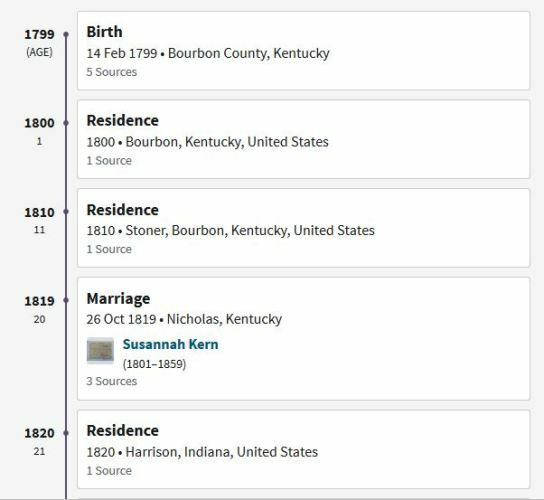 This entry was posted in Family History, Genealogy, History and tagged Adam Sears, Barton W. Stone, Bourbon County, Cane Ridge Church, county formation, Kentucky, maps, Nicholas County, Peter Hon. Bookmark the permalink.